My name is Amanda Phatdouang. I am an Anthropology major and Near Eastern Studies Minor and 4th year, senior at University of California, Berkeley. I started my 12-week Diversity Internship at the State Museum of Pennsylvania’s Section of Archaeology in mid May. On my first day, I described my computer experience to Janet Johnson, my mentor. Little did I know that my technology skills and my “California” laid back style would be key to making the most out this challenging internship. A few hours into my internship, I was producing maps to assist in the National Register nomination for the Shoop Site. I later spent the first two weeks of my internship on Adobe Photoshop working on maps, cataloguing books for the Archaeology Section library, helping Janet do a museum loan inventory at the Fort Augusta Museum and joining Dr. Kurt Carr on a trip to the Nesquehoning archaeological site. At the beginning of June, I spent two weeks with Janet and Andrea Johnson working with a team of volunteers and employees from the Atwater Kent Museum in Philadelphia. It was a labor intensive collection rehousing project, in which we reboxed and rebagged over 1300 boxes. The collection contained artifacts from predominately historical archaeology sites all over the Philadelphia area. As the boxes shipped to the State Museum, I spent the next few weeks reading and searching for reports and publications about the collection’s corresponding archaeology projects. I also wrote a blog entry about the status of the collection. At the end of June, I went on another museum loan inventory with Janet to Waterford, Pa to the Fort Le Boeuf Museum. An exhibit project involved my producing a map of “The Journey Home” for the Tuscarora Indian exhibit at The State Museum. During the final part of my internship, from the end of July until my last day in August, I worked on an Archaic period study, a projectile point typology project with Kurt Carr and Barry Kent. My task laid down preliminary work for compiling a reference collection for researchers to analyze point types from about 8,000-1,800 B.C I pulled points from 7 stratified sites including: 36Pe16, 36Pe61, 36Nm142. 36Cn164, 36Cn175, 36Nb58, and 36Ju104. I also attempted to identify depth and other provenience information for each projectile point by weaving through catalog databases, field records and excavation reports. . I had very little experience with archaeological sites and analyzing field records and reports and even Pennsylvania pre-history. However through the problems and difficulty, I learned more than I ever anticipated. During my final week, I also participated in floating soil from an archaeological site in Columbia containing Shenks Ferry Indian artifacts with Jim Herbstritt, Steve Warfel and a team of volunteers. By the end of my 12 week internship, I traveled all over Pennsylvania. I traveled to Sunbury, Nesquehoning, Columbia, Philadelphia, Waterford/Erie and thanks to the many road trip “detours,” I’ve gone all over the Pennsylvania countryside and seen everything else in between. I worked on 2 archaeological sites, met 3 generations of State Museum Archaeology Senior Curators including Barry Kent, Steve Warfel and Kurt Carr, went to 2 forts (Augusta and Le Boeuf), handled countless artifacts, met many kind people from the museum like Sue Hanna and of course every Thursday I tasted what Harrisburg had to offer with Dr. Walter Meshaka. Kurt, Liz, Dave and especially Janet, thank you for the wonderful learning experience. Dr. Irvin Uhler who volunteered at the North Museum of Natural History’s Archaeology Section during the 1990’s once stated that, “archaeologists prefer to revel in minutia – you guys [meaning we archaeologists] strive to learn more and more about less and less”. The subject, which also happens to be the topic of this week’s TWIPA blog he was commenting on, just happened to come up during one of our many lunch hours which usually took place in the archaeology lab located in a crowded, dimly lit room of the museum’s basement. 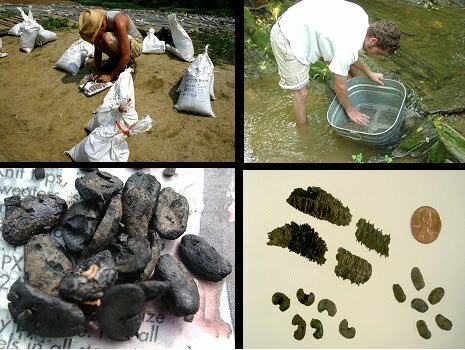 The topic Dr. Uhler was referring to is the water separation technique or flotation method whereby small plant and other tiny non-plant remains are recovered from archaeological sediments. The short history shows that the technique immediately gained widespread use by the archaeological community during the 1960’s when Stuart Struever successfully employed the flotation method to recover small fragile remains from feature soils at the Koster Site, a deeply stratified prehistoric site located in the Lower Illinois River Valley. Since then the technique has become the principal method used by paleobotanists to recover small scale carbonized plant remains. In form, the process simply involves immersing a soil sample of a standard volume in a tub of water, often determined by the total size of the feature from which it was taken. A bracket-supported window screen size hardware cloth, serving as the tub’s bottom, facilitates the discharge of soil as the carbonized plant particles are skimmed off the water’s surface. The larger, more dense material such as lithics, bone, shell, certain nutshells, and not infrequently water logged charcoal, are some of the kinds of objects that settle to the bottom, trapped by the hardware cloth as the sediment particles fall through the tub. Such trappings are called the sample’s heavy fraction. Both the light and heavy material fractions are then dried, sorted, and later identified by trained personnel. Other more environmentally friendly flotation devices have been designed for use in the laboratory where the sediments are self contained in such a way that they are returned to the archaeological site and used as backfill. Some of the more sophisticated devices have “streamlined” the process into one system where the water is recycled and used again and again. 1998 Evaluation of the Flote-Tech Machine – Assisted Flotation System. American Antiquity 63(1):143-156. 1976 An Efficient, Inexpensive Arid Land Flotation System. American Antiquity 41(4):491-493. 1968 Flotation Techniques for the Recovery of Small Scale Archaeological Remains. American Antiquity 33(3):353-362. 1979 Koster: Americans in Search of their Prehistoric Past. Anchor Press/Doubleday. 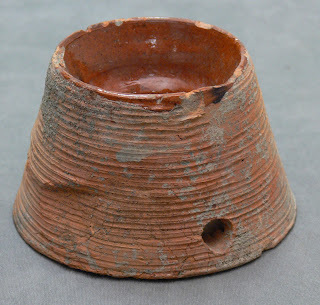 Last week we posted this image of a redware vessel for our “what’s it” blog. This unusual object is in fact a cockroach trap. The ribbed, unglazed surface of the exterior was easy for roaches to climb up to the top and the lure of sweet molasses inside of the “well” was too much for the roach to resist. The roach would lose traction on the slippery glazed wall of the “well” and once inside could not escape. The small hole above the base of the vessel allowed for filling of the well with sticky molasses. The hole would then be plugged with a cork to keep the liquid contained. Most of us are familiar with the modern methods of eradicating roaches - potent pesticides and chemicals, and the ever popular “roach motel”. But the use of non-toxic methods for trapping cockroaches is still being utilized. Various websites provide information on creating roach traps from jars or cans. All utilize a substance to lure the insect into the trap and provided a barrier prohibiting escape from the vessel. Colonists who didn’t have chemical treatments for removing pesky roaches created an ingenious trap that is still a functional design today. Historic accounts of infestations on ships document the spread of roaches from Europe and Africa to North America, but do not address efforts made to eradicate the pests. 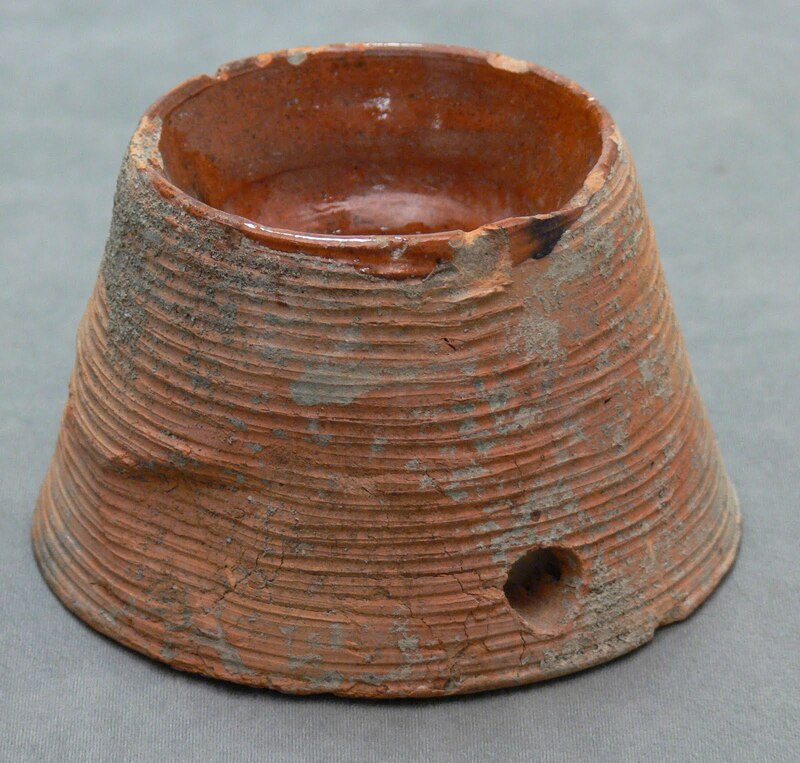 The evidence that they were a problem for colonists exists through household items such as this redware roach trap. Archaeology can be used as a tool for telling the whole story of everyday life and often uncovers daily activities left out of the historic record. An artifact such as this provides tangible evidence of a creative solution to a problem facing people in urban settings such as Philadelphia, where this example happened to be excavated. Join us this week as we explore a “what's-it”. We introduced this category in our blog several months ago and decided to revisit. This household artifact was likely produced from local clay available to potters of the 18th and 19th century who produced ceramic wears identified as redware. The term is applied to earthenware pottery produced from red clays native to south eastern Pennsylvania. The availability of clay and the low firing necessary to produce this ware, made it inexpensive for utility in the household. Pennsylvania Germans produced large quantities of this ceramic type, although only a few known examples of this particular artifact survive today. This unusual conical shape has straight sloping sides with circular ridges from top to bottom. The exterior surface is not glazed, but the interior “well” is glazed which provides a smooth surface. There is a small opening just above the base. It’s size is relatively small, average size of examples found are four inches high and six inches deep. Please post your best guess and check back next week to learn more about this interesting object.